Take off that headset, put down your controllers and take a rest. Welcome to Field of View, where we take a look at all the VR and AR stories of the past week. This week, we got a good look at the HTC Vive Focus, the standalone headset that will be exclusive to China. we also gave Qualcomm's Snapdragon 845 standalone headset a go, plus we got to play some footy with Vive Trackers on our feet - and let Mike tell you: it was a beautiful thing. That's not all that happened this week though. We've got all the little news and recommendations your alternate reality-loving heart can take. Read on, friendos. Every month, Steam conducts a survey to see what kind of hardware its users are, well, using. The optional survey scans a users' PC or Mac to see what kind of hardware they're running, and that includes VR headsets. 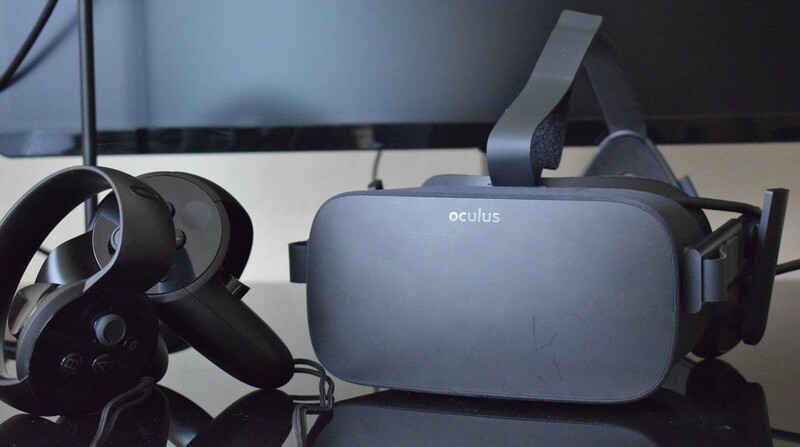 For the first time, Oculus Rift has overtaken HTC Vive as the most used VR headset on the platform, 47.31% to Vive's 45.38%. While this doesn't tell us how many units each has sold, it's an impressive feat for Rift, which has come a long way since its release (exclusives and a new low price of $399.99, which is considerably lower than Vive's $599.99 price). Maybe the upcoming HTC Vive Pro will help turn the tide back to HTC's favor. We first heard about HTC Vive's exclusive Ready Player One experiences last year, and now it seems they're ready to debut just as the Steven Spielberg movie makes its way into theaters. The experience will debut at Austin's SXSW festival - and we'll be there to check it out. There'll be a total of six VR experiences that take place in the world of the film. If you happen to make it to the festival, you'll also get a DJ set from star Tye Sheridan in virtual reality. There are a number of companies, big and small, working on augmented and virtual reality platforms and hardware. LucyD is hoping that a Blockchain-backed app store can set it apart, and it's teamed up with Roomful to make it happen. While LucyD focuses on making an argonomic, comfortable AR headset, Roomfull will make tools that allow anyone to make VR content easily and simply. The Blockchain technology will essentially allow anyone with a LucyD headset to make VR content for everybody else - with the possibility of earning from it. LucyD's Blockchain platform is backed by an Ethereum-backed token called LCD. There are 50 million available right now and you can get a single one for $0.25. Volkswagen isn't just for fun games and interesting 360 videos, it can be used practically to educate and train people. That's exactly what Volkswagen was thinking when it teamed with Innoactive to launch its VR platform last year. Now the company is stepping it up, announcing that it plans to train 10,000 employees with more than 30 training simulations this year. That's one way to make employee onboarding interesting, we suppose. Hulu has a VR docuseries that takes a look at various music acts. Where they grew up, what influenced their music, and a behind-the-scenes look at concerts. The latest artist to be featured is French pop band Phoenix. There's no Hulu subscription required either, so watch away. Brandon Sanderson's popular Stormlight Archive series has finally been adapted into a visual medium. And guess what? It's in VR. Arcturus has taken on the task of adapting the story to virtual reality, but it hasn't exactly done a word-for-word, scene-for-scene strict interpretation. Instead, it's come up with an experience that makes the world real and puts you in the shoes of hero Kaladin Stormblessed. Available for HTC Vive for $10.99.